Will the Astros sign Dallas Keuchel to a long-term deal before he hits free agency in 2019? The Houston Astros and American League Cy Young Award winner Dallas Keuchel avoided arbitration with a one-year, $7.25 million deal, but did the two sides ever get around to talking about a long-term contract? According to the Houston Chronicle, Keuchel and the Astros have had substantial talks about an extension during the offseason, but nothing has come to fruition just yet. Keuchel isn’t eligible to be a free agent until 2019. After Keuchel’s award ceremony for the AL Cy Young, he was unsure of his long term future with the Astros. "Ultimately, you’re trying to win championships," Keuchel told the Houston Chronicle, "And whether I spend only three more years in Houston or I’m an Astro for life." Despite no long term deal in effect between the Astros and Keuchel has come about yet, the team, under general manager Jeff Lunhow, has been more than capable of locking up it’s better young players with extensions. Jose Altuve signed a four-year, $12.5 million deal prior to the 2014 season, and Jon Singleton, who has yet to pan out in the majors, signed a five-year, $10 million deal while still in the team’s minor leagues due to the then-promising numbers. With Keuchel already making $7.25 million in 2016, a long term commitment would likely command more than $120 million to take away some his potential free agent years. The Astros, however, don’t mind starting to spend on their best players to keep them with the ball club by attempting to sign extensions for young players. "In order to sign someone beyond their years of control, both sides have to want to make a deal work," Luhnow said. "A lot of those conversations don’t result in something happening, because the sides just don’t necessarily match up in terms of how they see the thing coming together. But we’re going to continue to have those conversations, and this young core is going to be together for a while. I don’t know what a while means, if it’s three years, six years, etc." 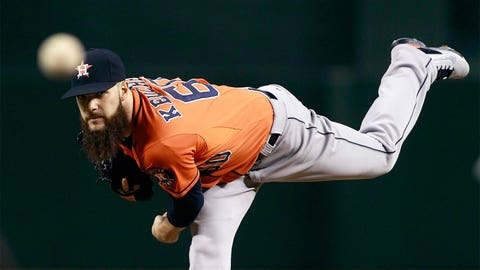 Keuchel certainly has earn the big bucks, en route to his first Cy Young Award, he threw 232 innings with a 2.48 ERA, 1.017 WHIP with 216 strikeouts. He also made three postseason starts for the Astros returning to the playoffs for the first time in 10 years throwing 14 innings with a 2.57 ERA.